Elizabeth, whom I haven't yet introduced, was a classic Santa Cruz hippie. Though only in her mid-20s then, she was a throwback to the 1960s. While we never really got along with each other, I must give my props to her. She was a plank owner of the Santa Cruz Center. When the Center moved to San Jose, she moved with it. No doubt, Elizabeth was a devoted disciple. And as a former jock myself, I had to hand it to her: Elizabeth was tough. At about that time, Guru had issued a challenge to all of his disciples to see who could break certain times in the marathon. For the guys, the standard to beat was 2 hours, 30 minutes for the 26-mile race. For the girls, the standard was 3 hours, 30 minutes. Elizabeth promptly ran 3:28. She was the first girl disciple to do so worldwide. As for the rapid attrition of our Center, Guru was apparently concerned. It looked as if the San Jose Center was on the verge of disappearing all together. Such concern no doubt increased when our nominal Center leader -- Ratna -- left the path. At that point, even though Rick, Elizabeth and I were already attending Center meetings in San Francisco once a week, Guru decided that we needed some adult supervision. So, he told S.F. 's esteemed leader -- Sevika -- to become our new Center leader. Sevika must have been in her mid-30s then. 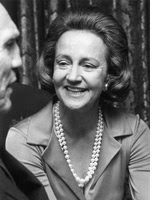 In some respects, she now reminds me of the late Katharine Graham (pictured), who with little prior experience, inherited the leadership role of the male-dominated Washington Post Company and made it work, despite the initial resistance from the guys. Through the mid-'70s and early '80s, the S.F. Center had been a spiritual powerhouse: the most prestigious and accomplished Center outside New York. It was largely driven by a cadre of dynamic and capable young men led by Sevika's then-husband, Saumitra. By the early '80s, however, those guys began to sour on the Center. Saumitra was the first of them to go, unceremoniously dumping Sevika for another woman and leaving her as the sole leader of the Center. Apparently, most of Saumitra's friends knew about his affair for some time before he actually left and were not terribly sympathetic to Sevika's plight. I wasn't phased by that nonsense. I liked Sevika from the start and was glad to have her join our San Jose Center meetings each Wednesday night. Almost immediately, she began teaching us Bengali devotional songs written by Guru, with the idea that we'd perform them at the next April Celebrations. I found Sevika to be a very warm person and she seemed almost protective of me (though I didn't think I needed it). She was concerned, for instance, that Charlie's departure from the Center might affect me adversely, so she talked to me about it from time to time. I also found her to be down to Earth and funny. One time, after meditation at the S.F. Center, the disciples were hanging out in the upstairs living room after meditation. Venu -- a particularly likable and energetic disciple -- asked me about my wrestling career at school. In a sheepish way, he admitted that he, too, had been a wrestler in high school. He then, half jokingly, suggested that we should wrestle some time (intimating, I thought, that he could beat me). Immediately, someone else said, "Why don't you wrestle right here?" Venu -- beginning to show his nerves now -- looked to Sevika and said, "We shouldn't wrestle here. It wouldn't be appropriate." With a mischievous twinkle, Sevika said, "Sure, go ahead." She was all for it. Like most of us, Sevika got great joy in seeing Venu's reaction: a kind of deer in the headlights look as it dawned on him that his secret wish was about to be fulfilled. In any event, the disciples made some space. Venu chose the down position to start. I pinned him a few seconds later.